A DUBLIN-BASED writer-director has had his movie nominated for a prestigious US award – just over a year after he appealed to Facebook users to help him make it. Director Terry McMahon told TheJournal.ie that, frustrated by three of his previous projects collapsing, he took a rather unusual approach to making his next movie – and it paid off. In December 2009, the award-winning McMahon let his frustration at the movie industry out by having the words, ‘The Art is in the Completion. Begin’, tattooed onto his body. Intend making no budget feature, Charlie Casanova, need cast, equipment, locations, and a lot of balls. Any takers? Within 24 hours more than 130 people had replied. 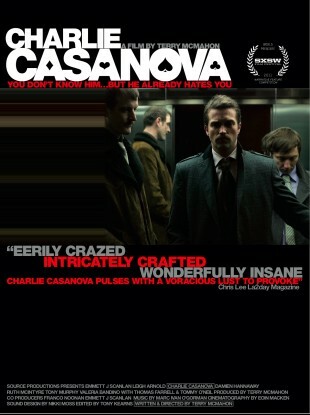 The film Charlie Casanova was made in 11 days using borrowed equipment and independently financed by McMahon himself. Facebook helped once more when, during post-production, McMahon lost his job and advertised acting classes on his Facebook page to make money. Despite its difficult birth, Charlie Casanova has begun to reap the rewards its director hoped for. It is the first Irish film and first non-American film in six years to be selected for the Narrative Feature competition at the prestigious SXSW Film Festival in Austin, Texas. It’s a real David and Goliath story. It’s huge, there has been interest from Variety, Filmmaker and other publications. But what happens now, I have no idea. McMahon describes Charlie Casanova as the story of “a ruling class sociopath who knocks down a working class girl in a hit-and-run and uses a deck of playing cards to determine his fate”. He says the film is like no other Irish film and that people have begun to “recognise the integrity in it”. It is not yet known if the film will be shown in Ireland. “I’ve had 140 emails from producers and distributors around the world expressing interest in the film, but not one from Ireland,” said the director, who is originally from Westmeath. You get to the point where you think, ‘is this it?’ Are you going to be tenacious and try and make it yourself? It has to go beyond money, beyond fame. The cast includes Emmett J Scanlan (as Charlie Casanova), Leigh Arnold, Damien Hannaway, Ruth McIntyre, Tony Murphy, Valeria Bandino and Johnny Elliott. SXSW 2011 will be held in Austin, Texas, from 10 -19 March. Visit the website to find out more about Charlie Casanova. Email “Facebook status update leads to success and US award nomination for Irish film”. Feedback on “Facebook status update leads to success and US award nomination for Irish film”.